We finally received a urolith analysis report from the Minnesota Urolith Center. The stones were 95% struvite and 5% ammonium urate. This shows a small amount of minerals were present from the stones she developed back in 2014, but primarily the minerals that built up in the bladder are different. Struvites are also known as magnesium ammonium phosphate hexahydrate stones. Struvite crystals and stones can generally be prevented by feeding a canned prescription urinary diet, which moderately limits magnesium and phosphorus, encourages a more acidic urine, and prevents saturation of these minerals in the urine. These diets do not contain medication, they are simply formulated to prevent the formation of struvites. There are multiple diets available from Hills, Royal Canin, Purina, and Iams. Over-the-counter “urinary health” diets have not been proven to prevent the formation of struvites. For Gracie, the recommendation is to feed canned food only. We are not recommending a specific prescription diet for prevention because the diet for prevention of struvites and the one used to prevent ammonium urates are very different in formulation. We encountered another complication: Gracie wouldn’t eat the canned version of either of these diets. As this point we will attempt to prevent stone formation using dilution; canned food provides much more moisture than dry food. With increased moisture intake, her bladder should fill more frequently and the urine will be flushed out more often as well. Gracie felt unwell for a few days after surgery, but ultimately she perked up and has been back to normal ever since. We hope there are no more stones in her future! Gracie on the steps. – photo provided by Gracie’s owner. Six year old Gracie visited us in January for a cystotomy to remove stones from her urinary bladder. She was diagnosed at the Emergency Veterinary Service of Iowa City last month and had been receiving treatment through another veterinary clinic. After almost one month, she was still experiencing discomfort and passing bloody urine. The development of bladder stones (also called uroliths) is not entirely understood, but seems to be related to the amount of certain types of minerals in the urine. These minerals combine to create crystals or stones. Some urinary stones can be dissolved using certain prescription diets designed for stone dissolution. The prevention of stones depends on which minerals are building up in the bladder. Gracie has a history of bladder stones; in 2014 she was diagnosed with ammonium urate stones, which are not very common in cats. These stones cannot be dissolved, so they were surgically removed at the time. Unfortunately, when she visited us in January, it was determined that another surgery was necessary. Gracie is very fearful when outside of her home and becomes quite distressed with handling, so we sedated her in the bottom of her carrier by gently covering her with a thick towel and giving her an intramuscular injection of sedatives. This is one low-stress technique we use for cats who do not tolerate handling when fearful. Once sedated, a thorough exam was performed, blood was drawn for pre-surgical screening, and radiographs and an ultrasound of the bladder were obtained to give us a little more information. The ultrasound image on the left shows a urine-filled bladder from a different cat with no stones present. The image on the right is the ultrasound of Gracie’s bladder. This is a small bladder filled with debris that appears light in color on ultrasound (black arrow). After the blood-work was complete, Gracie was prepped for surgery and placed under gas anesthesia. The bladder was very thick and red, a sign of severe chronic inflammation. An incision was made in the bladder, and Dr. Hayes removed the stones and flushed out the bladder. Surgery took about an hour, after which Vet Tech Katie used the therapy laser on the incision site. Laser therapy is standard at the clinic after every surgery and dental procedure to reduce inflammation and shorten healing time. Gracie then woke up from anesthesia with some warm towels in a quiet room. Our surgery patients go home with 1 or 2 types of pain medication, depending on their overall health. A comfortable cat will recover more quickly than one that is still experiencing pain. Four days after surgery, Gracie was feeling okay but we were concerned about her appetite. After any procedure, we strongly encourage owners to stay in touch and let us know if their cat is not recovering well. We do expect that some cats will experience a few days of poor appetite or lethargy, but if that doesn’t resolve we want to determine what is causing the delayed recovery and find a solution as quickly as possible. In Gracie’s case, her obesity is a possible complication. Overweight and obese cats cannot be allowed to starve themselves for more than 2-3 days before we risk the slow development of hepatic lipidosis. This image shows the stones extracted from Gracie’s bladder. You can imagine how much damage they do to a sensitive feline bladder over time. After the stones were removed, they were shipped to the University of Minnesota Urolith Center for analysis. Treatment and preventative care to avoid future incidences will be determined once we know what type of stones were removed. We can’t assume that these stones are of the same type that developed in 2014. How can bladder stones be prevented? The best preventative for potential urinary tract disease is to feed canned food. Dry diets are easy and convenient and there is nothing wrong with feeding some dry food, but cats generally don’t drink water until they are already dehydrated. Dehydration causes the body to retain water, which means very little urine is produced. Because the bladder doesn’t empty until it is full, urine can sit in the bladder for quite some time before it leaves the body. That stagnant urine can cause inflammation; crystals can form and stones may develop. We want to see the urine flushed out of the body frequently to prevent stone development. Canned food has a high moisture content to keep cats hydrated and keep urine moving. -If your cat is restricted to a specific dry diet (like Royal Canin Hypoallergenic food), or simply doesn’t like canned food, you may try soaking the kibble in warm water before offering it. -If both canned and dry options are available, you can also mix kibble into canned food, or sprinkle the dry kibble on top of canned food to encourage them to eat it. -To encourage more frequent drinking, provide more than one source of water. Cats like their water and food offered in separate locations, with one bowl on each level of the house. Some cats prefer running water, and circulating water fountains are available. -If your cat needs to eat canned food but refuses to do so, please contact us right away for a solution. We will update this post when we learn what type of stones were recovered from Gracie’s bladder and we’ll let you know how she is doing as she recovers! Even though our pet cats live indoors, they maintain an instinctive desire to hunt prey. With no outlet for this behavior, cats can become bored and anxious. Lack of stimulation can develop into behavior problems such as aggression towards other pets or people, over-grooming, inappropriate urination, destructive scratching or chewing, excessive vocalization, and restlessness. 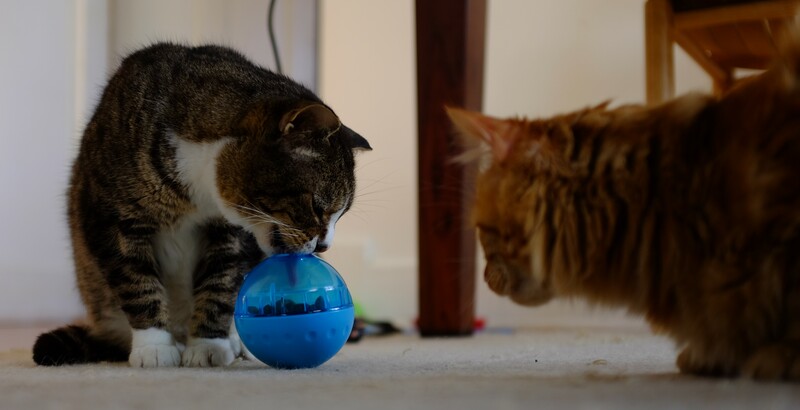 A simple way to increase a cat’s level of activity is through the use of foraging toys, slow-feeder bowls, and food puzzles, which provide mental stimulation through problem solving. Reduction in anxiety associated with meal times. Prevention of obesity by making the cat work for meals, instead of eating as quickly as possible from the bowl. Reduction in vomiting for cats who eat too quickly. Prevention of unwanted attention-seeking behaviors associated with hunger and boredom. For cats that are used to having their food available in a bowl, it is important to start with an easy foraging technique. Place some dry kibble around a foraging toy to get them interested. Clear plastic containers with multiple holes are the best starter toys, but some cats may take to an opaque treat ball right away. Fill the toy full and be sure the holes are large enough to allow the kibble to fall out easily. The more rewarding the puzzle, the more motivated the cat. If a cat is less food motivated, you may have to start by offering tasty treats in the toys in order to create more interest. 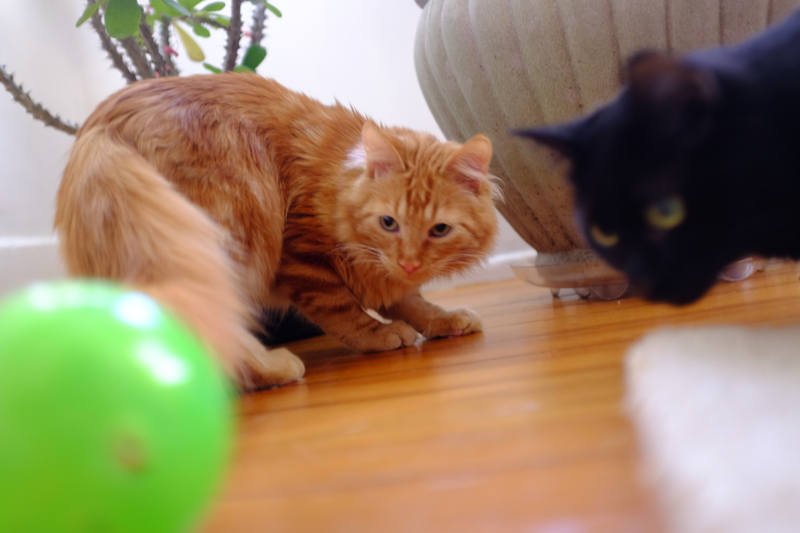 Toys with fewer holes, opaque toys, and toys that don’t roll easily can be used when your cat masters the beginning-level treat ball. For advanced cats that quickly take to foraging, there are products available that require the manipulation of moving parts to access food. You want your cat to be challenged, but not frustrated. Trying a variety of products will allow you to find the find the right level of difficulty that keeps your cat interested in foraging. Interactive treat toys and puzzles – Outward Hound, Nina Ottosson, Trixie Pet Products, Aikiou, Northmate, etc. Hole size is important. Some treat toys don’t accommodate large dental kibble. Level of difficulty. Spherical toys are easiest to use. Cubes are much more challenging. Some toys work better on tile or hardwood floors, while some are designed to work well on carpet. If foraging toys are left out all night, you may want to keep them away from bedrooms so you won’t hear them rolling around. Cats love variety. Offer different kinds of food toys and puzzles to keep them interested. As always, shop local! If you are in Iowa City, Leash on Life carries several options in both the cat and dog departments. You can find a large selection of products online as well, but be sure to read reviews before ordering to verify that the product is the right size and style. Don’t forget to check out dog products! Many of the smaller toys can be used for cats as well. The Cat Clinic of Iowa City Pinterest page includes a board full of feeding toys and products, but you can also get creative at home. Lots of containers can be transformed into a feeding toy with a little ingenuity. Won’t this add a lot of extra time to the daily feeding routine? For daily food foraging, simply fill a variety of food toys once a week and place them in an airtight container. Take some toys out every day and replace them as needed. This is a good option for a household where multiple family members are responsible for feeding or in a busy home where mealtimes aren’t an option. Won’t the extra food make my cat gain weight? Initially a cat may gorge themselves on food when they realize it is always available, but over time the cat should get used to snacking throughout the day. Overweight and obese cats can actually show some weight loss with forage feeding as they are burning calories while foraging. Can forage feeding work with more than one cat? This method of feeding may not work for every household. Food can be offered in creative ways, even if there are multiple cats who cannot eat the same diet. Consider using food toys and puzzles instead of regular bowls at meal times. If all cats do eat the same food, provide multiple food toys with a variety of difficulty levels. 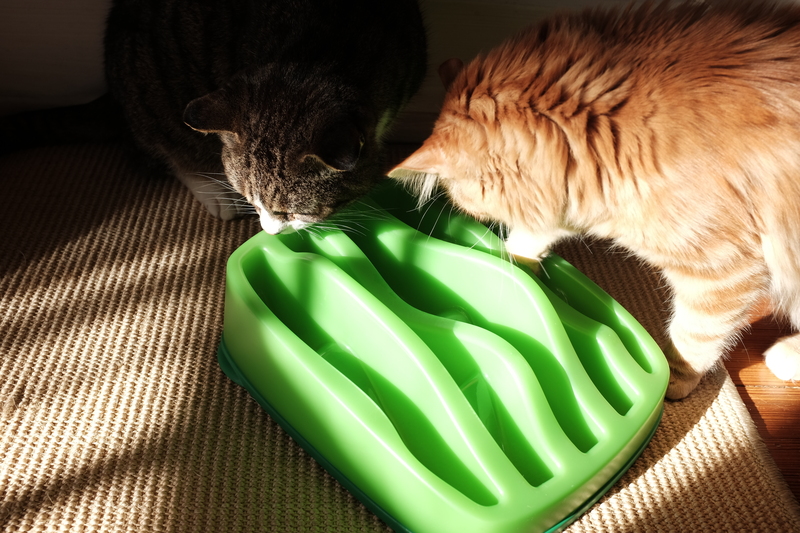 It might help to direct the less motivated cats to the toys that are easiest to use so that the super-motivated or advanced cats don’t eat all the food. Can I still forage feed if my cat only eats canned food? This can make food foraging more complicated, but not impossible. Most slow feeder bowls are too deep for canned food use, but the Trixie Fun Board has one section of shallow tongue-sized depressions to be used for canned food. Shallow ice cube trays may work as well. The Outward Hound Star Spinner and Nina Ottosson Dog Tornado are two other options. We’ll keep searching for more ideas! I tried to forage feed, but my cat isn’t grasping the concept. What should I do? Every cat is different. Some like treat balls, some like slow feeder bowls. Try different options until you find one that works. Also, some cats love to chase tossed kibble. Or you might have a scavenger hunt where the kibble is hidden throughout the house for the cat to find it. There are lots of fun ways to feed. Be creative! Keep in touch with us on Facebook for reviews of some food toys and puzzles we’ve tried. Check out this website foodpuzzlesforcats.com, maintained by feline behavior consultants for reviews of food puzzles and some ideas for homemade toys.